Yash Raj Films' #SuiDhaaga - Made in India is a heartwarming story of pride and self reliance, which finds its roots in the heart of India and reflects the passion that runs through the veins of every single Indian. And now to promote the local artisan through film, Anushka Sharma shares a heart-warming and inspiring story of Pabiben, who inspired millions with her local crafts ship. Though the video doesn’t features Anushka Sharma or Varun Dhawan but it features voice-over from the duo, talking about the tale of Pabiben. Sui Dhaaga- The film is helmed by National award winning Producer - Director Duo of Maneesh Sharma and Sharat Katariya (Dum Laga ke Haisha) and features Varun Dhawan and Anushka Sharma in the lead roles. 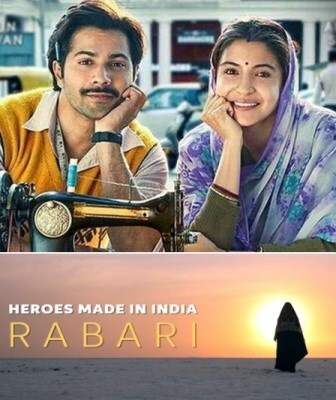 Dhawan plays the role of a labourer in the film, and Anushka Sharma an embroiderer. Both the actors learnt how to sew and embroider, and also operate the sewing machine.